If you haven’t upgraded your portable Bluetooth speaker in several years you might be due for an upgrade as they have come a long way in recently. There are a ton of low-cost portable Bluetooth speakers available, but the high-end portable Bluetooth speakers that have come out recently are impressive. One of those speakers is the JBL Charge 3 that came out back in May 2016. This is a waterproof portable Bluetooth speaker and a power bank all in one! 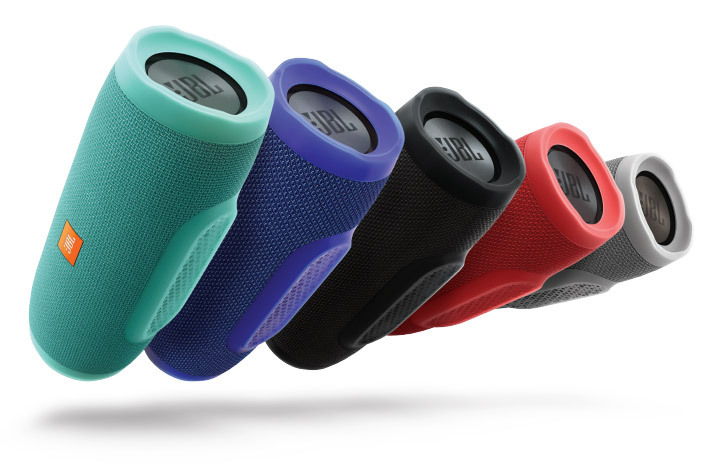 The JBL Charge 3 Waterproof portable Bluetooth speaker retails for $145.93 shipped in black, but you can also get it in blue, red, gray and aqua. For that price you better get some killer sound and outrages battery life, so let’s take a closer look at what you do get. Inside you have a 6,000 mAH (22.2Wh) Lithium-ion Polymer battery that has up to 20 hours of music playtime and it can charge smartphones or tablets through the rear USB 5V / 2 Amp charging port. When it comes to music you have two 50mm transducers that each have a 10W power rating and a frequency response of 65Hz-20kHz. Today we are looking at the JBL Charge 3 in black that is sold under part number JBLCHARGE3BLKAM. Inside the retail box you’ll find the JBL Charge 3, 5V 2.3A USB wall power adapter, Micro USB Cable and paperwork for the device (quick start guide, safety and warranty cards). The bright orange color for the JBL wall charger and cable will help it from getting lost or left behind when out and about. The JBL Charge 3 a tube that is 8.4-inches in length and about 3.5″ in diameter. The portable speaker easily fits in one hand and isn’t too heavy at 1.76 pounds (800 grams). 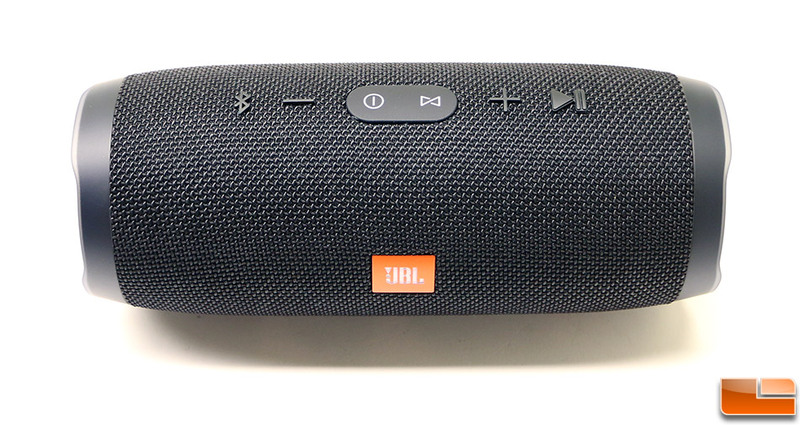 The controls for the JBL Charge 3 are up top and you have volume up and down, Bluetooth pair, power, play/pause, and a button to link this device to other JBL speakers. There is no skip button, but if you hit the play button twice quickly it will skip to the next song. The Charge 3 also has noise and echo-cancelling speakerphone built-in, so answering calls from your speaker also works impressively well. 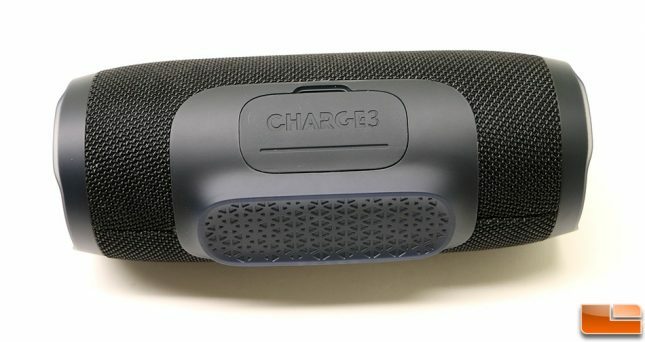 Here is a look at the five lights on the bottom of the JBL Charge 3 that let you visually see how much battery life you have. They light up progressively as the 6,000 mAH battery is charging and let you know how much battery life is left if you are draining it by playing much or charging other devices. You can also tell how much battery is left by using the JBL Connect app. Each end of the JBL Charge 3 has passive radiators to show you just how powerful your speakers are! 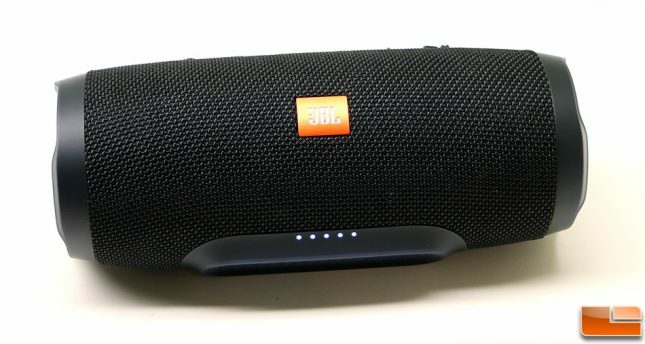 The JBL Charge 3 is pretty decently sized portable Bluetooth speaker and it just so happens to have big sound. You can crank up the volume and have no problem filling a large living room with good quality sound. Outside, the speaker looses a bit of it’s punch, but still projects sound a good distance alough you’ll want to be within 30 feet of it. The good news is the Bluetooth signal will limit you to about 60-75 feet and that helps ensure a good listening experience. On the back of the JBL Charge 3 you’ll find a sealed cover (large rubber flap) over the critical ports. This is needed for the IPX7 water resistance rating of the speaker. To have the IPX7 rating the speaker must be able to handle being submerged in water up to 1 meter deep for 30 minutes. We got our sample wet by the pool and in some light rain and never had any issues. 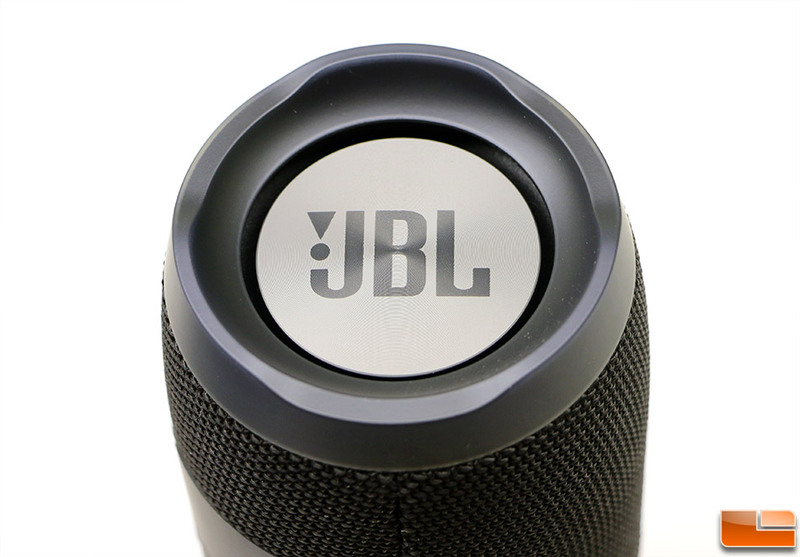 JBL went with a micro USB port for charging the battery and there is a along with the 3.5mm auxiliary jack and a USB 5V / 2A port for powering mobile devices. We noticed that the back of the unit says that the USB input is 5v / 2.0 Amp, but the output for the charger is 5V / 2.3 Amp. 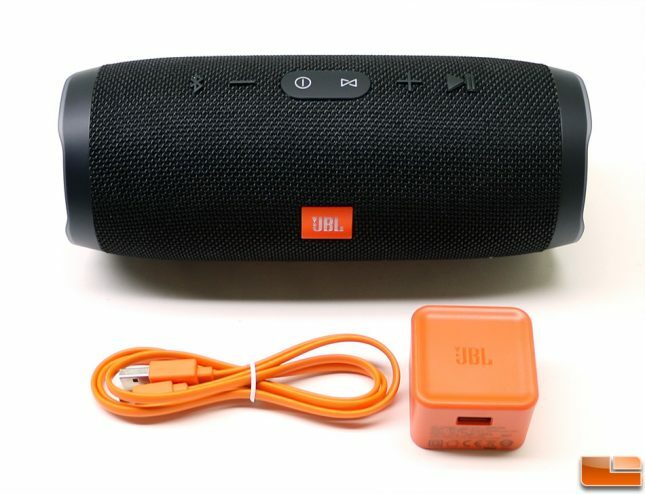 Since the wall charger is outputting 15% more power than the micro USB port is rated for we asked JBL if there was anything to be concerned about and they said that it was within specifications. It takes about 4.5 hours to fully charge the battery. 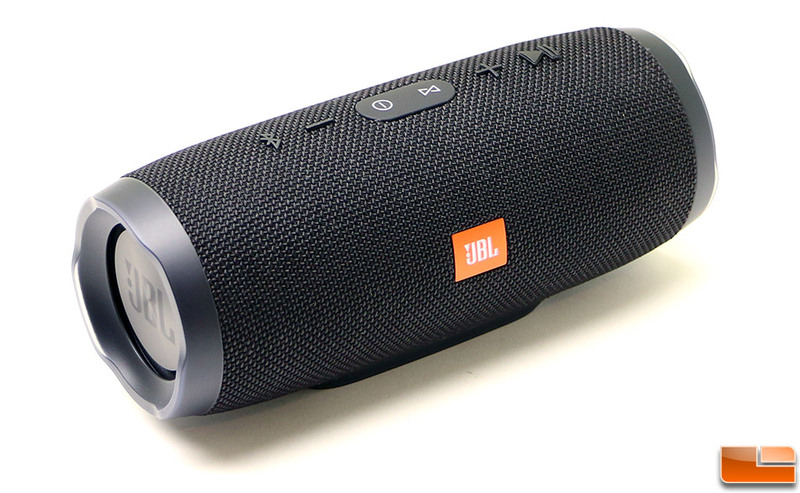 The JBL Charge 3 offer some of the deepest and most powerful bass we’ve heard from a portable Bluetooth speaker. We found that the sound quality was best when it was placed on a flat surface like in the image above. We highly advise giving the JBL Charge 3 an audition if you happen to live close to a Target store in America. They have the JBL Charge series on display and you can try them out and compare them with the other brands that also may be on display. The JBL Charge 3 left us impressed although the Charge 2+ also sounds pretty damn good after the latest firmware update. While the JBL Charge 3 might not sound any better to Charge 2 owners it does bring waterproofing to the table and a larger battery! 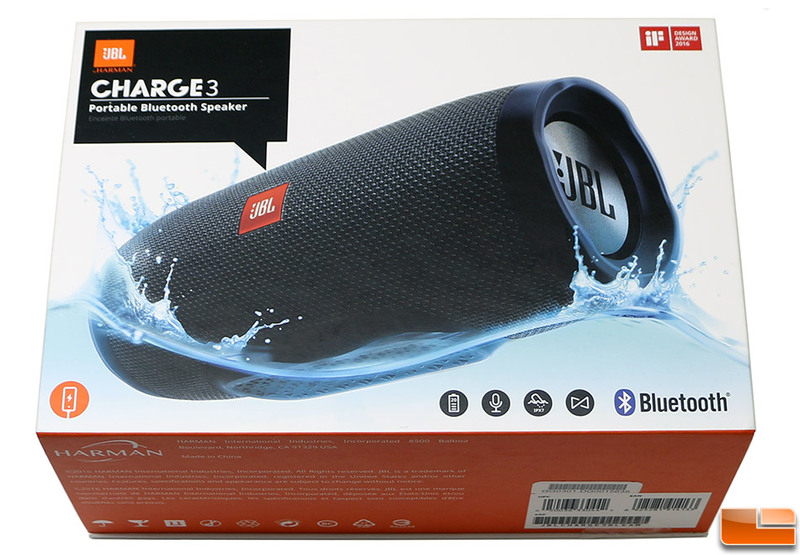 With prices starting at $145.93 shipped, the JBL Charge 3 Waterproof portable Bluetooth speaker might be higher than some want to pay for a portable speaker, but it does sound great!